Air sickness quickly takes hold on the first flight of 2018. Fox’s LA to Vegas, which uses a Jackpot Airlines plane as its workplace, would have been better served by skidding off the runway before its Jan. 2nd takeoff. Airplane! it’s not. Not even close. Dylan McDermott, now far removed from The Practice, is the marquee player. As the vain, womanizing Captain Dave, he’s looking for laughs after a grim and grimmer quintet of ABC’s Big Shots, TNT’s Dark Blue, FX’s American Horror Story, CBS’ Hostages and CBS’ Stalker. 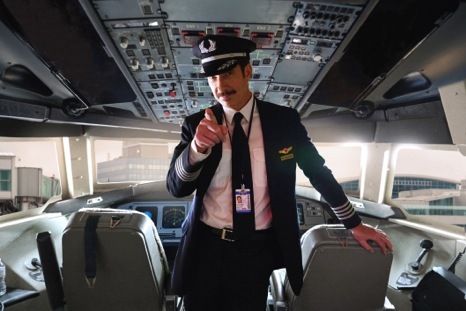 “Please, don’t cockpit block me,” the captain begs a flight attendant in the pilot episode while readying to land a willing woman for an in-flight quickie. One gets the feeling that the series’ six male executive producers, led by Will Ferrell and Steven Levitan (Modern Family), just couldn’t wait to gift McDermott with this oh-so-clever line. But hey guys, it’s about as funny as engine failure. Fox made three episodes of LA to Vegas available for review during an early January rush that also will include the launches of 9-1-1 and The Four: Battle for Stardom plus the return of The X-Files for a 10-episode run. The network has had some success, if not great reviews, for its other airborne series, The Orville (already renewed for Season 2). But it’s hard to envision this one sticking a landing with its juvenile “humor” and one-note cartoon characters assembling every weekend for the short flight to Vegas. There’s also a weekend gambler named Artem (Peter Stormare) and hunky, recently divorced British economics professor Colin (Ed Weeks), who visits his three-year-old son on weekends. Flight attendant Ronnie (Kim Matula) immediately goes gaga over Colin, as does her colleague Bernard (Nathan Lee Graham). The Jackpot crew also includes effeminate co-pilot Alan (Amir Talai). LA to Vegas sputters through it all with a combination of lame story lines and mostly lamer writing. Episode 3 is marginally the best of the bunch, with Captain Dave encountering his equally pompous longtime nemesis, Captain Steve (guest star Dermot Mulroney). The writing otherwise thoroughly under-achieves while leaving McDermott flailing about. “It’s time to get high,” he says before another wheels up. Right then and there, he should have bailed.